Brazil Cerrado Santos roasted coffee, 16 oz. Indonesian Clebes Kalossi roasted, 16 oz. 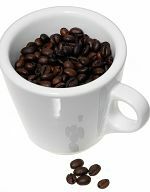 Sumatra Mandheling roasted coffee, 16 oz.